Been sick. But it gave me time to give the site a good update. All game list have been updated including a Sega page with my Genesis and Saturn games. Also added a link with pictures and information on my 1200 in 1 cart witch includes a complete NES Street Fighter. Check it out on my NES page. Getting ready for HeroCon in Charlotte, NC. Hope to see you there. I will also be putting up a link for the few Iron Man items I’m looking for soon. Just Picked up a Virtual Boy Looking for Complete games if anyone has any for trade! Also just completed twelve more NES games. Reproductions are back! Just need time to play them. Picked up a few NES games today (Battle toads / Double Dragon, Defender II, Galaga, Gauntlet II, Ikari III, Kid Niki, Mach Rider, Pac - Man, Sesame Street ABC and 123) also picked up Jurassic Park, MK 1 and 2 all complete for the genesis. Game’s page updated. Games came in. Updates all around and “New” Gallery pictures. Glad to report all the games now have a dust covers! I also will be having a ebay sale hopefully this coming weekend (50+ games). Put a few complete game pictures up. You can click on the link in “games” page. Hope to update the main picture section as soon as I receive the games below! Picked up 100 NES games off ebay. Trade and Games have been updated. Added “help Complete Games” page. Working on more pictures of the Rare complete games that I own. 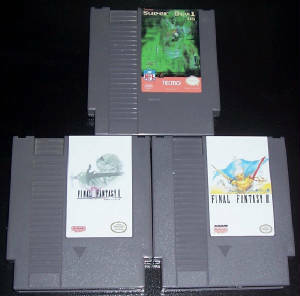 Sent a few ROMs to Leon at NES Reproductions. Looking forward to receiving Final Fantasy II, III and Tecmo Super Bowl 2006. I will post pictures as soon as I receive.